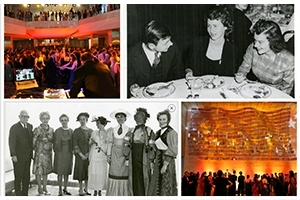 Color images from Founders Day Ball 2013; black and white image top from 1937 Founders Day banquet, on bottom from 1968 festivities. Images courtesy of University Archives. Four years ago, then-freshman Chandler Thornton stood among the crowd of students gathered beneath the marble arched ceilings and stained glass windows of the Library of Congress. Dressed in formal wear, he and the hundreds of others listened to AU President Dr. Neil Kerwin speak on the history of American University. It was Thornton’s first Founders Day Ball. Now a senior in the School of Public Affairs, Thornton has carried that pride into his current position as co-director of Founders Day planning alongside his best friend and former Student Government president Pat Kelly. Together, the two have organized the university’s largest ball yet to honor the university’s founding by an Act of Congress more than a century ago. The Saturday, February 21, event takes place—for the first time—at the Smithsonian National Air & Space Museum, where it will host a sold-out crowd of 2,000 students. For the former Kennedy Political Union director Thornton, the occasion offers a lot to celebrate. The AU community has celebrated the university’s founding in a number of ways since February 21, 1931, when it first recognized the 40th anniversary of AU’s incorporation by the District of Columbia in 1891. Still, the date actually notes February 24, 1893, when U.S. President Benjamin Harrison signed into law the university’s existence. That first event included a banquet, and students from the Women’s Guild held a pageant reenacting the events that led to the founding, with oratories by student actors playing presidents who visited campus. They also reenacted the university turning campus over to the military for the training of more than 100,000 soldiers during World War I. Since then, Founders Day festivities have alternated between similar pageants and more formal events under the name of Charter Day, featuring processions, speeches, and even the 1946 dedication of carillon bells that would chime from the attic of Hurst Hall. The modern, student-driven Founders Day Ball appeared in the 1990s, as the then-named Student Confederation held a gala at the Old Post Office Pavilion in 1995. In more recent years, students have staged the ball at locations including the Smithsonian National Portrait Gallery and American History Museum. Thornton sees the venues as particularly important both to the spirit of the event and to the university’s connection to its home in the District. For Thornton, the event may certainly be steeped in tradition and history, but he’s also enjoying the planning and organization of it for another reason—friendship. Since meeting in Student Government freshman year, he and Kelly have gone on to become fraternity brothers, roommates, and now seniors graduating toward diverging paths. He hopes that—gathered together among the artifacts of U.S. space and aviation history—students will hear Dr. Kerwin speak, dance, and share in moments that will shape their own piece of AU’s history, just as he did his freshman year and just as he’s done now in leading the event with his best friend.